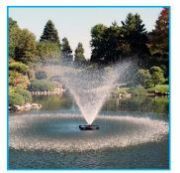 Water Garden Ltd are pleased to introduce the 4400EJF Floating Aerator Fountain. 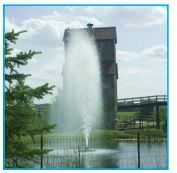 This floating fountain is suitable for use in fresh and salt water environments thanks to the pre-installed sacrificial zinc anode which can be easily replaced. The sacrificial anode will prevent damage to the pump motor and components when used in salt or brackish environments. 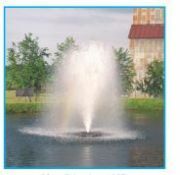 The fountain package includes 6 individual decorative nozzle attachments making a variety of display effects possible. The nozzle can be simply unscrewed from the top of the fountain and changed to an alternative. Linden – 3.4m high x 7.3m wide multiple tiered effect. Willow – 2.4m high x 7m wide trumpet effect. Spruce – 4.1m high x 3m wide voluminous column effect. Redwood – 4.9m high x 1.5m wide slender column effect. Juniper – 1.8m high x 8.8m wide trumpet effect. Birch – 2.6m high x 1.8m wide voluminous volcano effect. Each of the nozzles supplied offers different flow and aeration values. Some nozzles are better for aesthetics whereas others will offer high levels of oxygen diffusion. 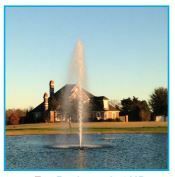 The willow and Juniper nozzles provide the best aeration and flow rates. 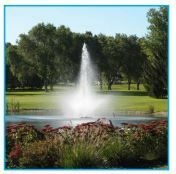 The 4400EJF Floating aerator fountain is powered by a 1HP fully submersible motor which is directly mounted to the floating body. The motor rotates a propeller which draws in water from around the float. 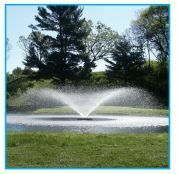 The water is mixed and accelerated through the nozzle attachment, cascading onto the water surface and introduces oxygen and water circulation to help improve and manage the pond or lake water quality. The fountain is supplied with everything required; 2 x 15m nylon tethering lines, Control panel with timer and in-built 20 AMP Circuit breaker and 6 nozzle attachments. The fountain comes with a 1m power cable to allow for a submersible joint and cable extension as per your own requirement to provide power to the shoreline. The 4400EJF features a shallow draft, meaning it can operate in water as shallow as 0.5 metres and due to its floating design, the fountain will automatically compensate itself during water level fluctuations. If you would like more information regarding our marine or freshwater fountains, please call our technical team on 02392 373735 or enquire via email via our contact page. We’d be happy to help.